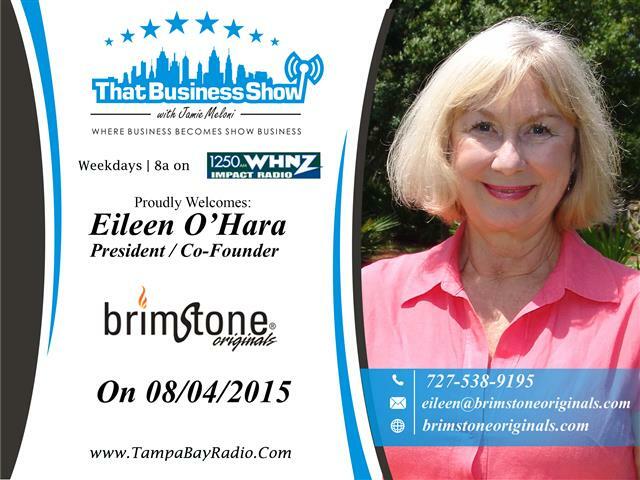 #ThatBusinessShow – weekdays at 8am on #1250WHNZ and available anywhere in the world on your iHeart Media app on your smartphone or live on http://www.tampabayradio.com. The show doubled its live viewer audience in both June and July and now averages over 1000 viewers live per show, not counting the radio audience which is not as easy to gauge. If you want to get involved in the show, please email Jamie@tampabayradio.com, I am always looking for content and sponsors! The show opened up today with a mother/daughter entrepreneurial team based in Largo. Eileen O’Hara and daughter Julie Stevens, Co-Founders/Owners of Brimstone Originals Specialty Foods, joined the show to talk about their family owned pepper based jelly product. Eileen shares a great story on the opening about the formation of the business which resulted ironically enough through a small robbery whereby she picked some habanero peppers from a friends plant and turned them into a Christmas Gift for her husband. After seeing his response and that of friends and other family members, Eileen knew she was on to something. In June 2003, they participated in the first pepper event and highlighted their product and the business took off from there. Julie joined the business shortly thereafter and today their products are found in Costco Warehouses and they are in talks to sell their product in 70 Publix stores across the state and northeast. Brimstone Originals has 4 pepper jelly flavors with two more on the horizon and they have partnered with a number of businesses including a co-packer that now handles making and distributing the product while they focus on growth and development. They are looking for investment into the company as well and if you are an investor that deals in businesses, then this is a company worth taking a closer look at. Their products are award winning and Eileen was Tampa Bay Business Journal Women of the Year in 2013 and the product won the “I Like It Hot” People’s Choice Award in 2014 and 2015 they won the “Favorite Vendor” award by the People at PepperFest. The product is all natural and gluten free and currently they are running a promotion for $2 off a jar to $5/jar with just $5 shipping in the continental United States, no limits on orders. Check out http://www.brimstoneoriginals.com for more information and places to find the product and reach out to Eileen or Julie for more information and ways to invest and get involved in this growing company. 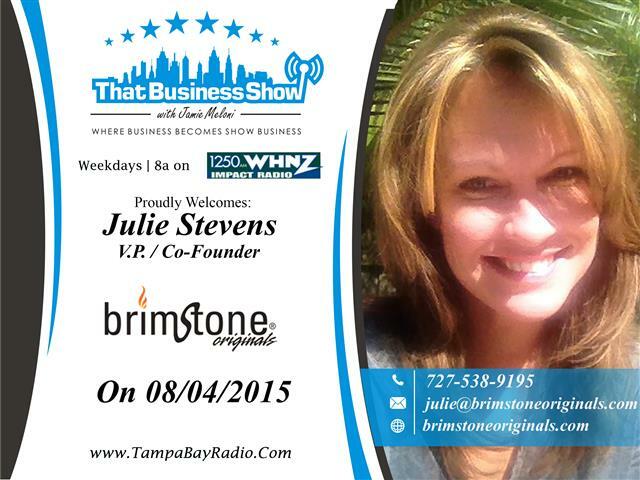 Eileen@Brimstoneoriginals.com or 727-538-9195 will get you in touch with Eileen! 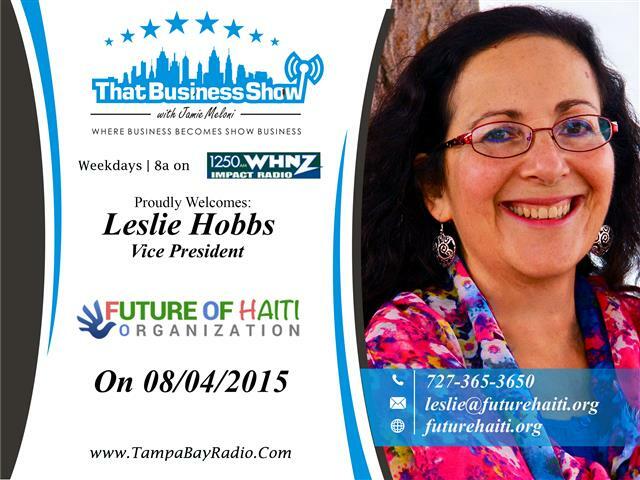 On the 2nd half of the show, I welcomed Leslie Hobbs, Vice President of the Future of Haiti Organization and Co-Founder Claude Reginald Jean (aka Reggie). Leslie is also a fellow Real Estate professional serving the Tampa Bay area but was focused today on her passion for this non-profit organization that she and Reggie founded together in January 2011. Many people have since forgot of the devastating earthquake that hit Haiti in 2010 and the impact of the event can still be seen in the Country all over. Reggie speaks on the opening segment that if you were to visit the Country today, you would have thought the earthquake happened just yesterday. Reggie, who experienced the earthquake first hand, shares his story and along with Leslie, they tell us how he helped shelter 137 children after the earthquake, many of which were orphaned because of the event. His compassion for others inspired Leslie to start this Organization and today the house where he sheltered 137 children now houses 98 children in Port-au-Prince Haiti as a center for orphans and his legacy resonates throughout the Country. There is also a school at the orphanage and their non-profit helps to support these efforts as well as provide humanitarian aid to all those afflicted by the earthquake tragedy in Haiti. Leslie and Reggie need the support of others to make this Organization grow and they encourage all people interested to contact them for donations or just to volunteer. They are holding their annual An Evening in Haiti fundraiser on August 8th at 6pm at the Earthscapes Garden Room located at 816 Alternate US 19 N in Palm Harbor too and cost if $50/person and proceeds go to helping the people of Haiti. To reserve a seat, please RSVP to info@thefutureofhaiti.org and contact Leslie at 727-365-3650 or leslie@futurehaiti.org for moreinformation and visit http://www.futurehaiti.org to learn more! This entry was posted in Entrepreneurship and Business and tagged brimstone originals, future of haiti, habenero, haiti, haiti earthquake, jelly, peppers. Bookmark the permalink. ← Show Recap – Never Drink Coffee During A Business Meeting and The Entrepreneurs Organization!